The municipality of Delta is suggesting separated bike lanes on highways. It has submitted a proposed resolution for the annual convention of the Union of B.C. Municipalities, taking place September 26 to 30, asking the provincial government to “provide parallel routes, physical separation, and safe facilities for cyclists along highway corridors”. Cycling is permitted on the shoulders of certain portions of provincial highways and bridges. “It’s a matter of economics,” Delta councillor Heather King told the Straight in a phone interview about possible options for separated bike lanes. The UBCM resolutions committee has made no recommendation regarding Delta’s proposal. But the committee endorsed for approval a less ambitious resolution submitted by the Sunshine Coast Regional District. The Sunshine Coast proposal urges the B.C. Ministry of Transportation and Infrastructure to increase the frequency of sweeping highway shoulders of gravel and debris as these pose risks to cyclists on bike paths. 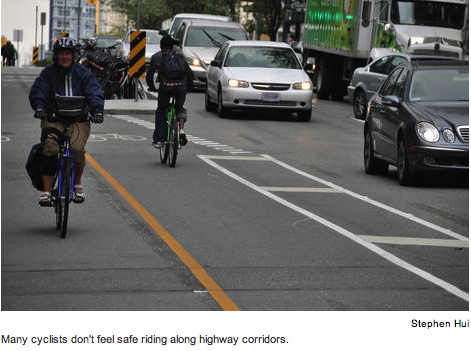 Rob Wynen, chair of the City of Vancouver’s bicycle advisory committee, said that because cycling lanes on highways are only delineated by a painted line, they are not very attractive to many two-wheel enthusiasts.